We have been in love with this yurt type for a long time now. 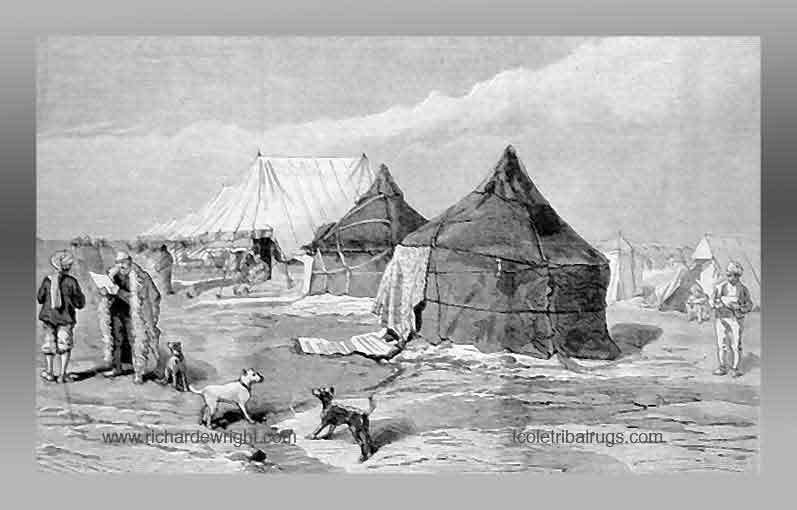 This particular style comes from the north of Afghanistan, and if you take a good look at the diagram (from Peter Alford Andrews nomad tent types of the middle east) you can see a few features that are obsolete almost anywhere else: the first is the two tiered trellis, the second is the small wheel with its extra high profile, but the best (in our view at least) is the double bend on the roof rafters. My personal intrigue started as a result of a conversation I had with a friend in Oregon who lives in a tipi, where we were speaking about tipi life versus yurt life and he mentioned that, although his wife might have liked moving to a yurt, he would miss the open fire. I thought that is funny, we have been making yurts for so long, but have only seen one or two yurts that have a attempted open fires. Strange, because traditionally most of them did have open fires. Before I went very far I paused and took a look at Peter’s book. Peter is our good friend and maybe the leading authority on the subject of nomadic architecture, so browsing through the different types in that amazing book (mentioned above) I came to this Yurt type and suddenly the coin dropped: A true wet weather, open fire Yurt will need to have a high pitch wheel to allow for the open fire, whilst still covering the hole from rain. 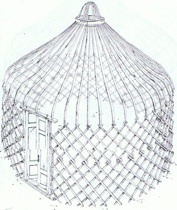 The turkmen wheels for example which expose a third of a very large diameter wheel to allow the smoke out would not do. Also I reasoned the double bend can in fact have been designed to help the smoke out of a smaller opening. We have made one of these next to test the theory. However, we did not really try the open fire because we pitched it on a deck, and also it had a white felt lining. Speaking to Peter I mentioned my theory. Truth is that I became somewhat obsessed at the time with it. There is this account by William of Rubruk speaking about the tents of the Mongols saying this funny thing, that they have a “neck like projection”. However the Mongolian ger (Mongol name for yurt) that we know, does not have this feature, but the Timurid period yurt pictures do show yurts to have a convex bend, like the type above. Again, this feature has totally gone off the yurt map except for the one type in North Afghanistan, made by the Chayar Aymaq (“four tribes”) amongst which is the Firuzkhui. 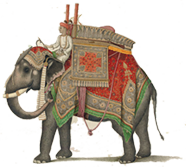 My theory was that the Mongols encountered wetter climates, when on the move and had to develop a better suited yurt for the rain. William did mention that they put clay on their felts (covers) to help with the rain, another thing which I am not sure is done now with Mongolian yurts. I explained it to myself that the Hazarra tribe, who have a similar tent style, in North Afghanistan claim to be descendants of the Mongol army warriors that were left behind and indeed they have more Mongol features than the neighbouring tribes. 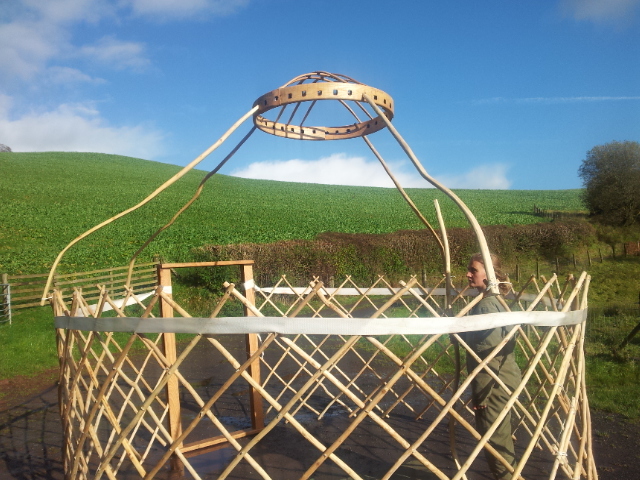 Peter, who is the expert, was not having any of this, saying that this yurt is not even used for cooking these days and that the top features a felt “hat” which is sealed closed and can’t even be flipped back due to the high shape of the roof. The cooking, he says, happens in a smaller tent nearby. But I was already obsessed with my theory, so I looked everywhere for a picture or anything to prove it. It is easy to recognise the double bend on these two yurts. This picture was drawn at the Pendeh Oasis, just north of the border of Afghanistan in Turkmenistan, where, if I am not mistaken the Great Game has ended with the Russians eastern conquest finally halted. This was the point where Britain told Russia that they would tolerate no more move ( toward their coveted India). 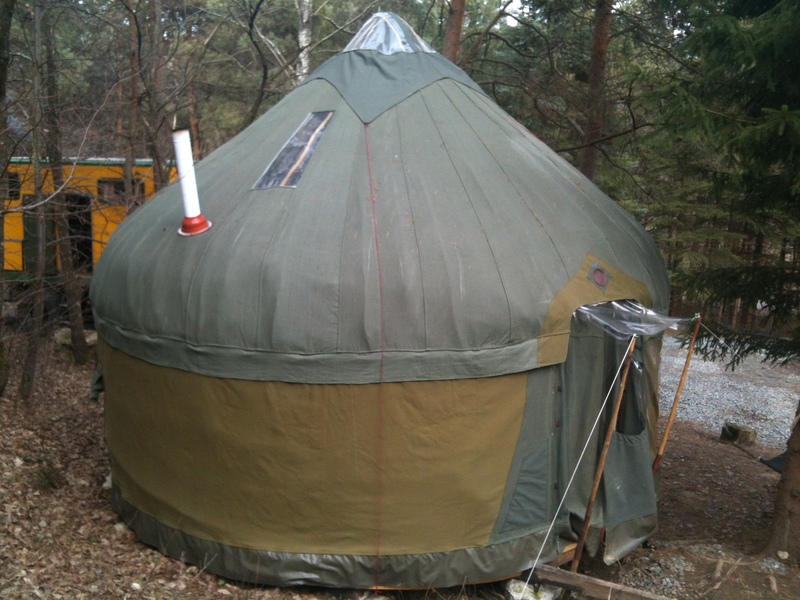 If you look at the picture well enough, you can see that there seems to be smoke coming from the rear yurt, and indeed the wheel covering seems to suggest that the felts were arranged to allow the smoke to escape, and although different from the current felt arrangement of the Firuzkhui the double bend is obvious. 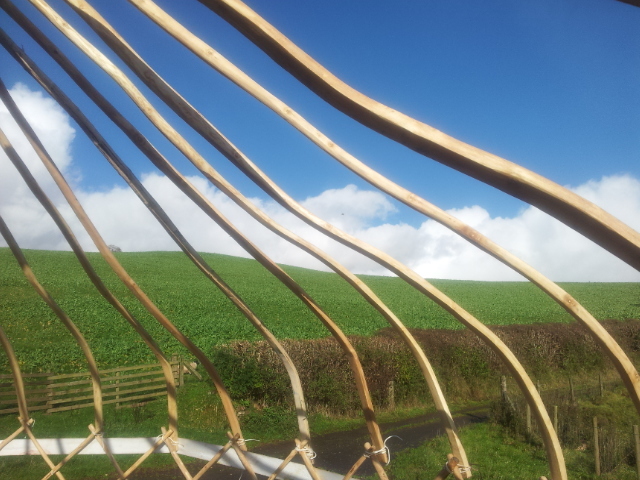 It proves that this double bend roof yurts did have open fires at least at one point in time. It does not prove that they are the first western yurts, made by the Mongols who got wet on their way to conquering Europe, but I still like to romanticise about that. 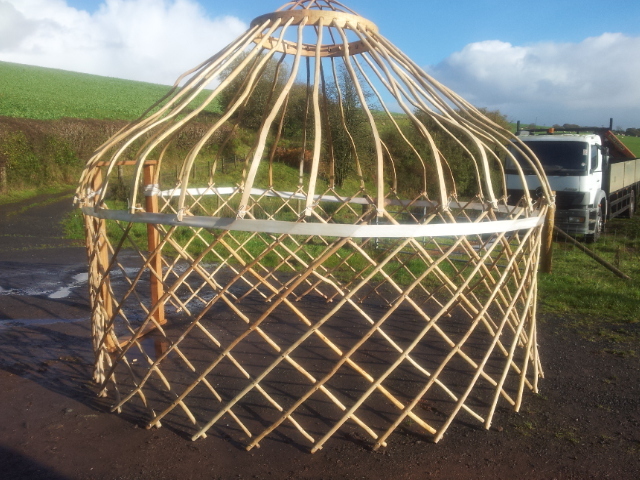 Here are a few photos of the latest frame we made of the same yurt type.